If you’re like most people, you probably associate home cleaning with springtime. 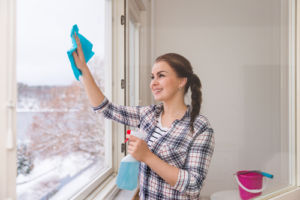 In fact, for many homeowners, the whole yearly ritual of spring cleaning is so taken for granted that we frequently forget to question why that season even became designated for house cleaning to begin with. For a lot of reasons, giving your home a thorough cleaning in the winter would actually make more sense, especially considering how the inhospitable weather is keeping you indoors anyway. Courtesy of Maids 4 Less, your prime source for high-quality home cleaning in Delaware County, PA, take a look at some of our tips for tidying up your home this holiday season. While dust is something to pay attention to all year round, you’ll probably need to do some extra diligence during the winter. Not only is the air warmer and drier than usual, but because of the frigid temps outdoors, your windows are always closed, trapping in dust and other debris. Be sure to change out your furnace filters about once a month for better energy efficiency and cleaner air. Also, don’t forget about the furnace itself. If you haven’t looked at it in a while, it could very well be covered in dust and other grime, so giving it a good washing certainly couldn’t hurt. If you regularly use your fireplace during cold seasons, you may want to keep an eye on your windows. Over the months, a thin film of soot from the smoke of the fireplace can accrue on your windows, giving them a not-so-clean look. Burning candles can produce the same effect, making it a good idea to give your windows a good wipe-down. The season’s snow, ice, and slush out in the streets usually translate into mud, salt, and water on your carpet and floors, especially your foyer. A deep clean could do wonders for your home’s appearance, especially if you rely on our residential cleaning in Chester County, PA, for a bit of help. Are you looking for a hand in your new winter cleaning goals? Contact Maids 4 Less today by calling our Glen Mills location at 610-854-8516 or our Warminster location at 215-344-7582.